Meilleur des deux mondes: Vues Mtn, cheminée, piscine, à pied de Village Green! Profitez de la commodité de vivre à un coin de rue du village de Woodstock sans sacrifier la paix et la beauté de la nature! Promenez-vous dans les galeries, les boutiques, les restaurants, les cafés, les théâtres et les discothèques ~ ou restez chez vous et détendez-vous sur votre grand porche enveloppant en été, surplombant un acre de pelouse paysagée, d'arbres et votre propre piscine creusée. En hiver, installez-vous confortablement devant un feu dans la cheminée en pierre rustique et admirez la vue sur la montagne par la baie vitrée du salon. Préparez des repas et des collations dans votre cuisine de campagne entièrement équipée avec un coin repas. Il y a deux chambres: une chambre principale avec un lit king-size et une chambre d'amis avec un lit queen (tous les draps fournis). Les installations comprennent: un accès Internet haut débit sans fil, une télévision par câble à écran plat avec lecteur DVD, un lave-vaisselle, un barbecue au gaz, des ventilateurs de plafond et de la climatisation et un parking privé pour deux voitures. Les chiens bien élevés et dressés dans des caisses sont considérés ~ demandez s'il vous plaît. Veuillez noter que des frais de 75 USD par animal s'appliquent pour les animaux domestiques. Un avis de trente jours est requis pour les annulations. Toutes les annulations sont soumises à des frais d'annulation de 10% ou 100 $. 00 (le plus élevé des deux). Les annulations faites plus de trente jours avant la date d'arrivée recevront un remboursement complet, moins les frais d'annulation. Les annulations effectuées dans les trente jours suivant la date d'arrivée perdront le paiement intégral. Un départ anticipé ne justifie aucun remboursement de loyer. Si vous pensez qu'il est possible que vous deviez annuler votre réservation, nous vous suggérons fortement de souscrire une assurance voyage afin de protéger votre voyage. Je vous remercie! If you are looking for that country/woods vibe but 2 minutes from all that is Woodstock, this is it. We loved being in the house so much we ended up eating most meals there. Relaxing and reading in front of the fireplace was amazing with the mountains in the background. The house has everything to make you feel you are home in your own house. My family had a wonderful time and found the house well stocked, quite cozy and perfectly closely situated to the center of Woodstock. House with a pool right in the village! This tiny house was fantastic. Perfect for a couple or a family with 1 child, but you could fit up to 4 people in the 2 bedrooms if you don't mind sharing 1 bathroom. We enjoyed being right in the village and popping out for small walks at all times of the day for shopping, coffee, snacks, etc. and seeing the life of the town. There's a toy store in town and kid-friendly dining options. AND on top of that, we had a private pool all to ourselves! 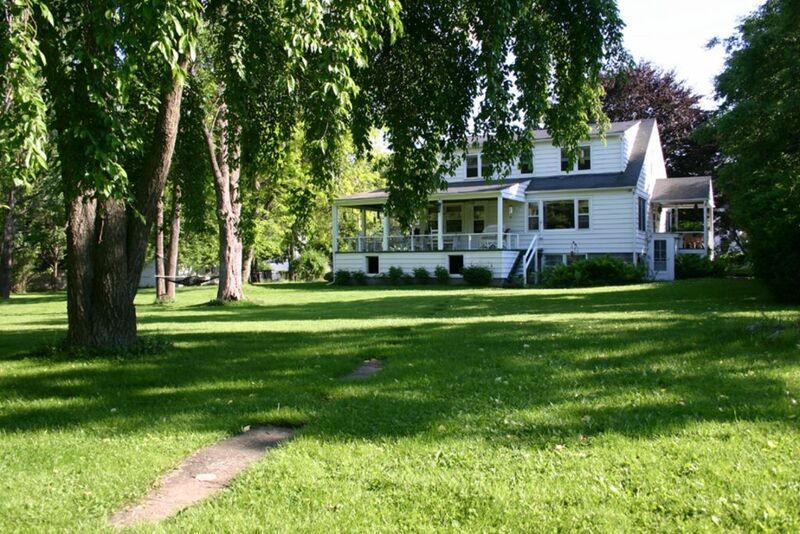 The yard is surprisingly expansive and there is a beautiful, peaceful view from the porch. It was so nice to grill our food and have wine and relax there. The house had everything we needed for a comfortable stay, including a king bed in the master bedroom. With the no-shoes policy it is very clean, and considering it is located on the main street of town, it is surprisingly quiet. You can hear whatever is going on during the day, like the community drum circle, but come on, it's Woodstock and that's part of the fun of staying here. And anyway, all noise stops as soon as the sun sets, so if you have little ones that need to sleep, they'll be all set. Between shopping and dining in town and laying out on the lounge chairs by the pool, we didn't use our car the entire weekend. The property managers were so professional and communicative, too. We will definitely book this house again! We loveeeeee our house in Woodstock ! Judy is wonderful and the house is simple but clean and not too big ! The property is stunning, the pool is perfect and we love that it's fenced in so the dogs can be off leash safely! The pool has a view of Overlook mountain and you are right in town, but it is stepped back, so more private. Sitting on the porch you have the view of the prettiest weeping cherry ! It is a place we always look forward to returning ! We were just there for a week with two little ones. We usually rent a house further out of town but this house was perfect, we started our car once!! Butcher and laundry a cpl doors down, as well as cvs. Everything is within walking distance AND you cannot see the road from the house. We had deer in the yard almost every morning and night. The inside of the house is great as well. It’s a gem, don’t pass it up. PETS Well-behaved and crate-trained dogs are considered ~ please ask. Please note that a $75 pet fee per dog applies. CANCELLATIONS AND REFUNDS A thirty day notice is required for cancellations. All cancellations are subject to a 10% cancellation fee or $100.00 (whichever is greater). Cancellations that are made more than thirty days prior to the arrival date will receive a full refund, minus the cancellation fee. Cancellations that are made within thirty days of the arrival date forfeit the full payment. Early departure does not warrant any refund of rent. TRAVEL INSURANCE If you think there's any chance that you may need to cancel your reservation, we strongly suggest that you consider purchasing travel insurance to protect your trip. Thank you!